New to video? Here are some different cameras to consider. I was recently contacted by a former student and they are looking to purchase a camera in the near future. The camera would be used for demonstrations, inside and outside as well as for interviews. This particular individual also wanted to be able to record good audio in these situations. So which ones are the best? What are the options? It’s a fairly common question I get so I thought i would share my response online in case other people have this question too. The short answer is: it depends greatly on your use and expectations. There are a number of great cameras out there nowadays and each one has slightly different features than others. These trade off come with a price, whether some are lighter, some are better in lower lighting, some are ultra portable, and some are scalable. Additionally the short answer about audio is that every audio situation can call for different needs. I would be unable to record quality audio during an interview or demonstration with almost any on camera microphones. The reasoning is that for clear and concise audio you will almost always need the microphone as close as possible to the person speaking. That being said there are a couple options I would recommend for you. A pretty decent camera attached to a smart phone. Made only by Apple. Incredible quality for something that fits in your pocket. Ive actually used a few of these on production shoots as secondary cameras and they are amazing. Its pretty good audio too, in the right conditions- more on that later. It’s compact and the color resolution is superb. I can easily plug it into my laptop and edit right away. The + models offers built in image stabilization, so even if im walking or holding the camera without a tripod the shots look pretty good still. Heres a sample of something I shot by just sticking it into a potted plant in my office when i noticed a mushroom growing. Lastly you can even edit and narrate right on the phone itself with the iOS version of iMovie. It’s “VERY”light. You would think that’s a good thing, but if I’m shooting for a long time or moving around I actually want the inertia that comes with a heavier body. Additionally there’s not really a good easy way to “backup all my media” other than say iMovie. I like to have all my clips that I shoot organized so I can use them at a later date and keep the original memory cards. It could be better in low light. Don’t get e wrong for a camera I can fit in my pocket, its pretty good, but I can’t use it reliably in low light situations. Compressed footage- if you are looking for ok quality with good lighting this isn’t that much of an issue, however the footage is a compressed format and can show signs of artifacting and dithering. Usually when i use this camera I need to Denoise the footage using NEAT video. No real focus or aperture control. It’s a very “automatic camera” and I cannot fine tune adjustments. Audio is great if you are near the device. If you have it across the table not so much. That being said it’s a great mic but in all my recommendations I highly recommend an external microphone. Apple tax- they are not cheap devices. It’s a lot to pay for a camera that doesn’t offer a lot of fine tune controls. iOS ecosystem- while you do not HAVE to have a MAC to go with your iPhone, they definitely make it easier to edit and shoot with it. Converting clips to work in windows is much more of a todo. At the end of the day it’s a great fun tool that offers some good results but I personally couldn’t use it as my main production camera. If there was a lower cost camera I would recommend as part of a quick video solution, I’d be very inclined to recommend this one. Its color is phenomenal and has great image stabilization. It has a zoom lens that covers all the focal lengths that I would typically use with a Prime lens set, and is pretty easy to capture great footage. It also offers 4k recording (though limited) and 960 FPS that can slow things down to almost 40x normal speed. And while there is no touch screen I find that to be a big plus. It records to standard SDXC (NOT to be confused with SDHC) Sd cards in an XAVC codec that is less lossy than mp4 codecs. Its great as a photo camera as well so it can do double duty as a still camera. There’s no microphone port to attach a separate microphone to. So even if I wanted to plug in a microphone to this camera I really cant. The battery life isn’t great. This isn’t going to record for a half hour block, maybe 20 minutes of non stop recording so youll need plenty of extra batteries. The buttons are small and can be tough to navigate. It almost has too many features, and navigating all the categories and sub categories can be a little daunting. As a travel camera its almost perfect, but you will absolutely need more batterires. As mentioned before- the menus. It can be challenging to figure out exactly what you want and how you want it set up. When recording in 4k you are limited to a few minutes per clip. This can really hold things back if you are trying to capture a long seminar or live event. Without being able to change lenses on this camera in addition to not being able to plug in a microphone are whats holding this back from being an excellent device. A solid video camera that just happens to be in a camera body. Beautiful color resolution and mice weight. Takes lots of different MFT lenses (can even use canon and other lenses with Adapters) Complete Electronic Viewfinder and zebras (this lets you see on your screen if something is going to be too bright.) 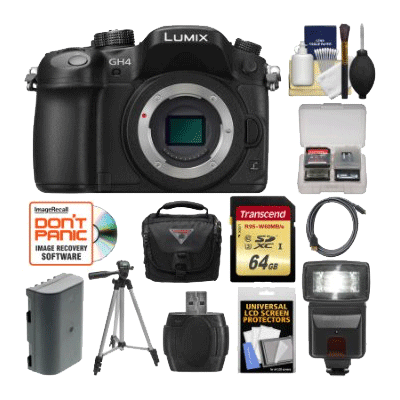 with this kit you have a flash for photos, cleaning kits HDMI cables extra battery and a wide to zoom lens. Total control over aperature and exposure. Can record at a pretty high iso without much noise. The battery seems to last forever. Ive personally recorded just about a solid hour at a time with one of these batteries before it needed changing. Has a microphone and headphone jack so its ready for sound when you include a proper Mic and Headphones. if you are new to photography and DSLR video it can be a pretty steep learning curve. It uses much of the concepts of pro photography and cinematography and with all that precise control this is not really aimed at novice users. Its MFT body meaning its not going to be that great in low light situations. The sensor just isn’t large enough to absorb the amount of light. While the camera itself isn’t that expensive it can get to be expensive with different lenses and cages, and matte boxes and rails and other accessories that would make this a full featured camera. To use it as a BNC camera you need to purchase a separate YAGH pro video and audio connector for it. And heres a GREAT review from Caleb Pike over at DSLR Video Shooter– He’s got a ton of info on some different pieces of equipment. Helps that he makes a lot of review videos too. Phenomenal day and night shots- Records in 4k natively, and can downscale to 1080 on the fly meaning its extremely high quality low noise video. High bit rate, while still recording to SDXC cards found everywhere. Has focus peaking and assisting. Has 2 XLR inputs for microphones with a small mixer built into it. It has a full HDMI size out. It has TWO SD card slots that lets me have a backup at anytime. 1 card can record constantly and the other will be start and stop. ND filters for shooting in day light. Has options for continuous power. Very easy to edit with in Adobe Premiere Pro. Almost future proof. This kit is a great kit, and really good for all around use however I with there were swappable lenses with this. I would still need a good tripod to use with this. It has an Infrared emitter to shoot in complete darkness, which seems like a feature that isn’t that useful. The mic included with this kit is OK- but its not anything special. That being said if you are new to cameras and audio I love this kit. The only other thing I have to say about this camera is that the screen itself is pretty small. Pro Level Video recorder with Shotgun Mic. Pro level recording in a full featured all in camera- Has a shotgun microphone 20x zoom. Focus and Iris control. Very easy to use in Automatic mode. Has high capacity battery, XLR and internal microphones. Headphone jack and all around solid camera without any compromises. Timecode control, wifi control. Just a ton of great features. Can record for a maximum of 13 hours at a time if you use the highest capacity XQD. Can record to SDcards but will lose speed and quality not 10% if can record full 4k at 60 on SD. XQD slots for recording. The Overall price tag with camera, media and a case will push this package into the $7000. Cant record and output 4k to both HDMI and SDI at the same time. The Ugly: For the price you could buy a couple of the Panasonic kits. That hurts! Other notable Mentions on cameras would be the Sony a7s or a7s II. I also like the Black Magic Cameras but because of various factors, (like totally different media concerns and low native isos) i haven’t included them in this list. Hope that answers some of your questions. I know that can be a lot of information however choosing the right camera and knowing what they offer can save a lot of trouble down the road. Out of these cameras I listed them from least expensive and least features to most. If I had to choose just 1 of these different cameras I’d have to go with the Panasonic HC-X1000. It just seems like the right balance of form and function. With that I would Also pick up an XLR shotgun microphone, a sturdy tripod, and a Lavaliere microphone. Do you have a favorite camera you use?